It's hard to believe the countdown is on... Chase's third (and last planned) heart surgery is just about three weeks away. We've known since June 2009 that our son would be born with a Congenital Heart Defect (CHD) called Hypoplastic Left Heart Syndrome (HLHS). Essentially, the left side of his heart didn't develop properly and we were told he would need a series of three operations on his half-heart to allow him to survive. Hubs and I finally had "the talk" with the kids last week. LO and Chase are now aware of Chase's upcoming heart surgery. Chase knows he had surgeries on his heart when he was a baby (he's seen pictures), but he has a very limited understanding of his current anatomy and physiology, mostly because we've been blessed with his incredible health through all of this, but also because we know he will live his entire life with this condition and we've been happy to give him as long as possible without having any concern over it. Plus, he's only 4, and there's only so much a 4-year-old can understand. We've been reading an excellent book with him that was recommended by a fellow "heart mom" called Franklin Goes to the Hospital. It talks about going to the hospital, having surgery, X-rays, etc. and has been really easy for Chase to understand. It's nice because it's prompted some questions from him and random discussions about our upcoming trip. We've been able to start helping him understand what to expect. I'm so grateful we can talk about it now so our entire family can begin to prepare! So of course quarantine starts tomorrow. LO will still attend school, hubs will attend work (sporadically and only as necessary) and I will still attend church, but we won't be having ANY visitors in our house nor taking Chase ANYWHERE in public. It's imperative that he stay healthy for the weeks leading up to his surgery because if he gets so much as a cold, we are looking at the possibility of rescheduling his Fontan. Let's not even talk about the arrangements already in place (rental home in Charleston, removing Chase from his 2x/week private school, grandparents lined up to help with the kids, preparing Chase for surgery, etc.). So yes, it's extremely important that all of us -- especially Chase -- stay healthy!!! I'm sure we'll find plenty of ways to have fun, stay busy and keep our minds occupied in the weeks leading up to surgery. If tonight is any indication, Chase is gonna be a riot! 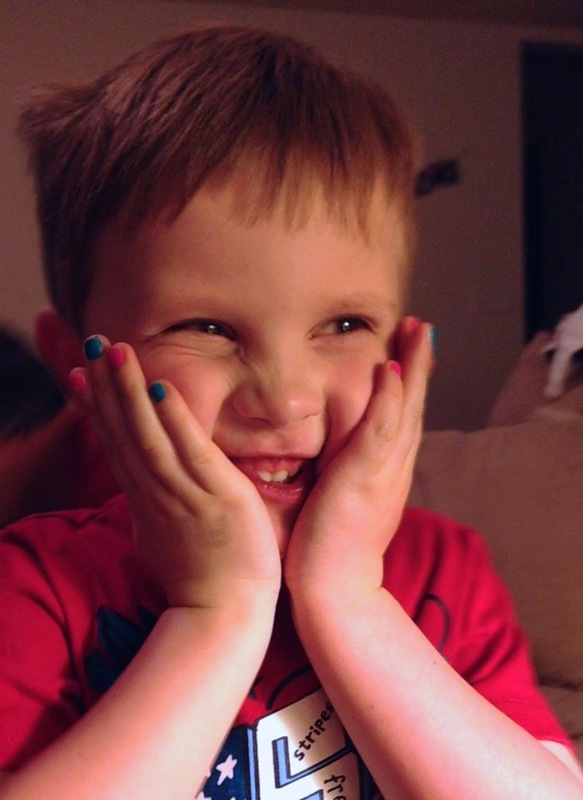 LO picked out pink and blue nail polish for she and I to use for our manicures tonight, and Chase insisted on getting in on the action, so he now has pink and blue fingernails, too! LOL! Randy and I were talking this afternoon about Chase and how different it is to be having this surgery as a four year old. 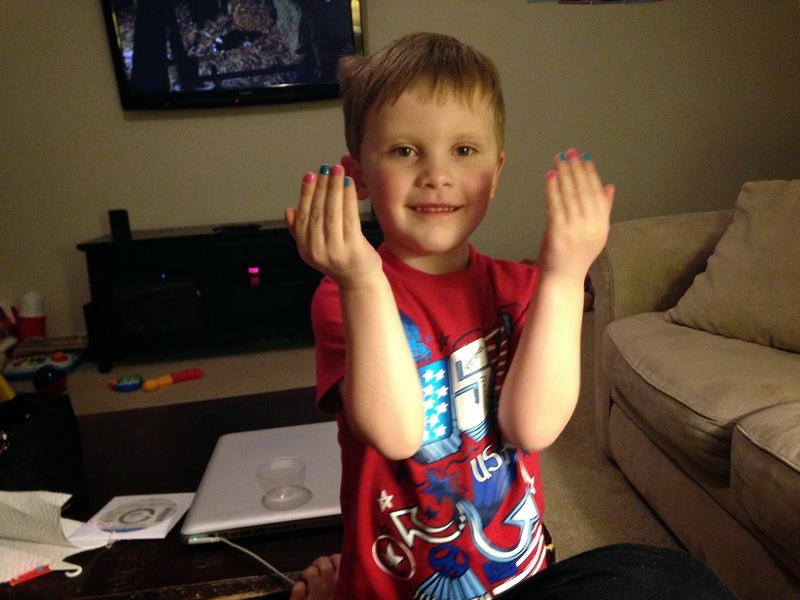 I think he will do great, and you will love seeing those pink fingers and toes. As for his energy level, LO better watch out! Her little brother is going to be fast! I think you should keep entertaining us over the next couple of weeks with silly pictures. That would be fun!